The Story of Our Creative State was animated by Fiona Dalwood with assistance from Christie Widiarto. The creative industries are significant to Victoria's culture, economy and society and central to its future. Creative sectors and occupations account for $23 billion in gross value added, and make up about eight per cent of the Victorian economy.2 They influence our quality of life and the strength of our communities, and provide a source of inspiration and entertainment. They have wide-ranging impacts that resonate across our culture, society and economy. Creative industries are an evolving mix of sectors spanning arts, culture, screen, design, publishing and advertising. They cover disciplines as diverse as game development and graphic design, fashion and filmmaking, performing arts and publishing, architecture and advertising, media and music, comedy and craft. They include activities that are commercially-driven and community based, experimental and export-intense. 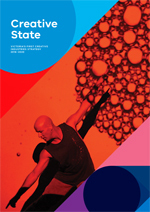 Across all disciplines, Victoria's creative industries are driven by a powerhouse of small organisations, micro businesses and sole practitioners, comprising the vast majority of the sector. They operate within a creative ecosystem that extends from iconic cultural organisations and global businesses to educational institutions, government bodies and community groups. 2 Boston Consulting Group, Victoria's Creative and Cultural Economy, April 2015.